Vilas Porphraphai’s love of science and humanity inspired her to become a nurse. She graduated from Boromrajchonani Nursing College in Bangkok in 1964 and received her B.S. in Nursing from Prince of Songkla University in 1986. After graduation, she devoted her life to service at Maharaj Hospital in Nakhonsi Thammarat to improve the quality of services at the hospital by integrating social services and technical knowledge. With wisdom and compassion, she helped the hospital to meet government standards and created an efficient system for nurses to realistically meet the needs of patients. Her organizational development model was then implemented at other hospitals. Nurse Vilas set up a medical equipment center in order to reduce the likelihood of equipment shortages, and innovated the development of new equipment in order to meet patient needs. 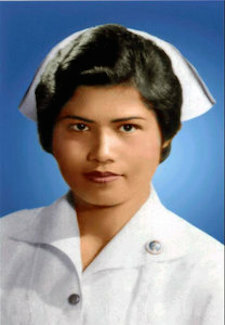 In 1993 Nurse Vilas received an Academic Award from the Ministry of Public Health, and in 1995 received an award from the Princess Boonjirathorn (Chumpon) Jutahthip Foundation for “Excellence in Nursing.” She has personally donated her physical services and finances to alleviate the suffering of people in need, and has been the guest speaker at many meetings and seminars whereby she shared her insights and compassionate philosophy of service. For serving society and caring for the sick and needy, we award Nurse Vilas Porphraphai.